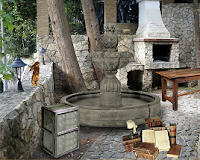 FirstEscapeGames - FEG Old Abandoned House Escape 4 is another point and click escape game developed by FirstEscapeGames. An old man is locked up in an old abandoned house in a deserted place. Rescue the man from the house by finding the key. Collect clues and hints and solve puzzles to get the key. Good luck and have fun! I had to see vid to solve. glasses on stone wall in Sc-1. Sneaky stick next to rusty barrel. Had to watch Video to find it. Not needed till the very end. Rest of the game was very linear, with some trial and error on what to use where. Some of the puzzles you have to click twice to find, as the barrel in the last scene and the box in the river. PS, Loved that rabbit in the first scene!